One time. There has only been one time that I have succeeded. And it was glorious. All the logistical stars aligned to make it possible: I was traveling alone, I was only staying one night, and I was staying at a friend’s house. It meant I barely had anything I needed to bring, and it all fit in my purse. It wasn’t even carry-on item + purse. It was just purse. Oh, the joy of ONE BAG TRAVEL! 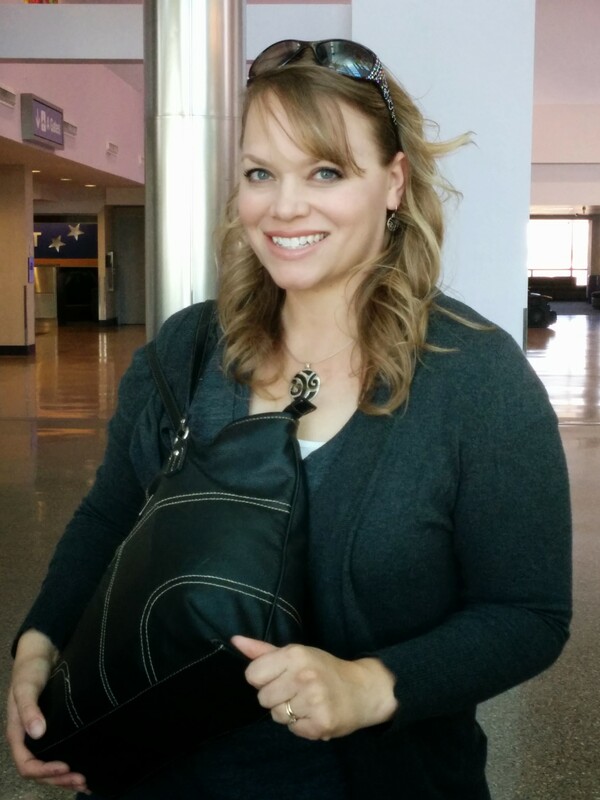 Look at how happy I am, about to get on an airplane with just my purse! (Plus, my hair looks good.) I felt like I had achieved Supreme Platinum Boss-Crusher Level among travelers. I think I need a badge to commemorate this. Or at least a tiara. More often that not, though, I am hovering far below Supreme. Maybe Silver Intermediate Level? That’s because I’m usually traveling with my family, and we are usually lugging a ton of crap. 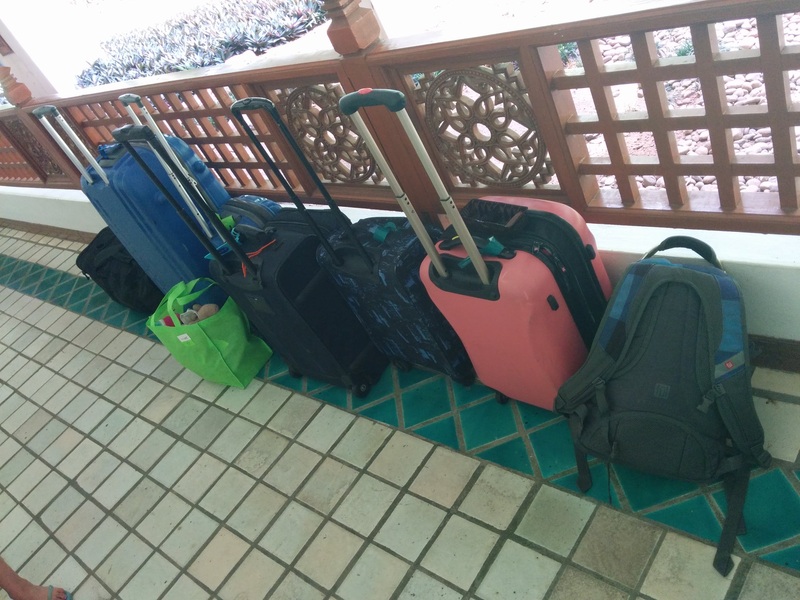 You might not know it from looking at our baggage, but my family is actually pretty good at packing light. We are pros at sink laundry, multi-purpose outfits, and bare minimum toiletries. We know the theories of traveling light, but there are almost always hurdles that keep us from actually accomplishing that goal. Take this trip we just finished, for example. We were gone from China for nearly two months, hitting five cities on two different continents. That in itself is not necessarily a reason to pack a lot. Everywhere we went was in the northern hemisphere and basically hot, so we weren’t having to contend with radically different climates as we sometimes do. But, then there were a couple luggage-expanding challenges. First of all, we had a wide variety of occasions to attend. We had outdoor activities and casual gatherings with friends, but we were also attending a wedding, giving presentations, and speaking at churches. My husband alone ended up taking four pairs of shoes when he would normally live in one well-loved pair of leather sandals all summer long. Maybe a casual tourist can get through Cambodia and Vietnam in just a pair of trusty Tevas, but they’re not planning on attending an important business meeting like that. Second of all, we were in the States. We knew it was our chance to stock up on stuff before returning to China. We’ve gotten pretty good at knowing what things we can either get in China or live without, but there are still some things (like shoes in my size) that are best purchased in the U.S. Again, casual tourists aren’t usually hauling all their supplies for the next year when they pack their enviably small bags. And so, there went the dream of one backpack + small carry-on per person. Still, I’m kind of impressed with us. Coming back to China, we didn’t end up with much more than the above dream. We had two additional checked bags and my purse. Not bad! I’m quite proud that we are a far cry from the two 70-pound checked bags per person that we once were. And we’re still doing better than many of the American families I see in airports. They’re still down at Free Download Level, lots and lots of trips away from unlocking Transpacific Flight Challenge or Fit Your Luggage in an Asian Taxi Saga. Still, I always feel like there’s room for improvement. So, pardon me, but I’ll just be over here reading through this annotated packing list from OneBag.Com to get a few tips.